Ferraris, Lamborghini Miuras, Maseratis, an Alfa Romeo and a Lancia are among the top classic cars auctioned at the 2016 RM Sotheby’s Arizona sale. 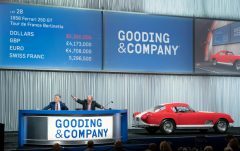 Although Ferraris will have to take an unaccustomed backseat at this Phoenix sale, six are still expected to sell in excess of a million dollar with a 1965 Ferrari 275 GTB and 1988 Ferrari 288 GTO expected to sell for between $2.4 and $2.8 million. The 1965 Ferrari 275 GTB by Scaglietti (est. 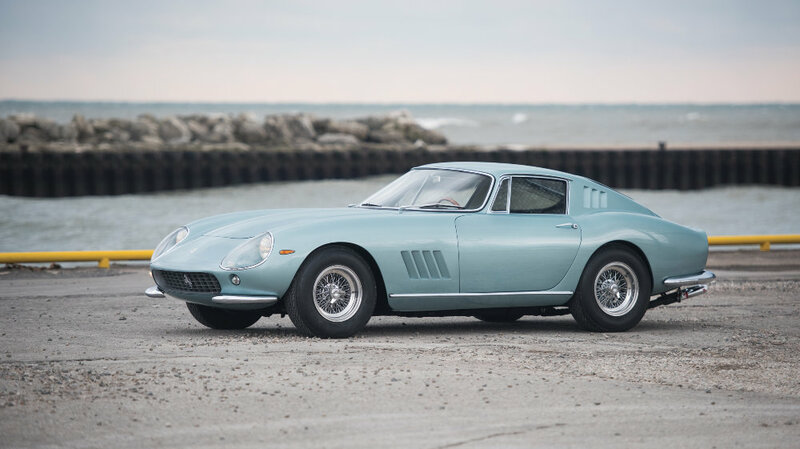 $2,400,000 – 2,800,000) is a fine but otherwise unremarkable example of this hugely popular and highly priced Ferrari model. It is Ferrari Classiche certified and believed to have covered only 50,000 miles since new. This 275 GTB is currently finished in light blue azzurro over black. Gooding will offer a 1966 Ferrari 275 GTB Long Nose during the same week in Scottsdale. The 1985 Ferrari 288 GTO (est. $2,400,000 – 2,800,000) is amongst the rarest of Ferrari supercars with only 272 built – far fewer than the F40, F50 and Enzo that would follow. This car has a particularly well-documented history and is Ferrari Classiche certified. It has covered only 15,000 km since new. The 1953 Ferrari 212 Inter Coupe by Vignale (est. $1,800,000 – 2,200,000) was the 23rd of only 26 Ferrari 212 Inter Coupes fitted with coachwork by Vignale. The car is in a well-maintained condition and is largely original without any major restoration work. The 1960 Ferrari 250 GT Cabriolet Series II by Pinin Farina (est. $1,800,000 – 2,100,000) was the 98th of 200 produced. (Gooding will offer numbers 39 and 46 at the 2016 Scottsdale auction.) This cabriolet is a matching-numbers example in a recently restored condition finished in its original color combination of bleu sera over pelle natural. The 1965 Ferrari 275 GTS by Pininfarina (est. $1,600,000 – 2,000,000) was the 167th of only 200 examples built. Although mechanically similar to the 275 GTB, the spider shares no body panels with the Berlinettas. The car is presented in its original silver over bright red color scheme. The 2011 Ferrari 599 SA Aperta (est. $1,100,000 – 1,500,000) is one of only 80 open-top 599s built by Ferrari in honor of Pininfarina’s 80th birthday. All 80 cars were sold out prior to delivery making it rather rarer than other modern Ferraris. The car has covered only 1,200 miles since new. The 1959 Maserati 3500 GT Spyder Prototype by Vignale (est. $1,500,000 – 2,000,000) was one of probably three prototypes built by Vignale and displayed at the 1959 Turin motor show. Maserati previously rejected spider designs of its successful 3500 GT Coupe but 242 Vignale Spyders would finally be built. The 1962 Maserati 5000 GT Coupe by Allemano (est. $1,500,000 – 2,000,000) is one of only 20 Allemano-bodied 5000 GTs produced. The 5000 was originally designed following a request by the Shah of Iran for a car a bit more special than the standard 3500. In all, only 34 of the 5000 GTs would ever be built and sold at a price twice that of the 3500 GT. The 1971 Lamborghini Miura P400 SV by Bertone (est. $2,000,000 – 2,400,000) is the more expensive. This Miura was the only one ever finished by the factory in bleu medio with a pelle bleu interior, which begs the question why it is now yellow over beige. The car is one of only five singe-sump SVs sold new to the USA with air conditioning fitted by the factory. The 1971 Lamborghini Miura LP400 SV by Bertone (est. $1,300,000 – 1,500,000) is a late-production Miura S that has been in the Isao Noritake collection for over 32 years. It has covered only 3,788 km since new. The 1955 Alfa Romeo 1900 SC SS Berlinetta by Zagato (est. $1,400,000 – 1,800,000) is one of only around 39 Zagato berlinettas built. It was raced in period by the Madunina racing time with a first in class and fourth overall at the 1955 Vuelta a la Cordialidad. The car was exhibited at the 2011 Pebble Beach Concours d’Elegance. The 1955 Lancia Aurelia B24S Spider America by Pinin Farina (est. $900,000 – 1,100,000) one of only 181 left-hand drive Spider Americas built. It is fully restored and offered from the Craig McCaw Collection and was previously in the Andrew Collection.